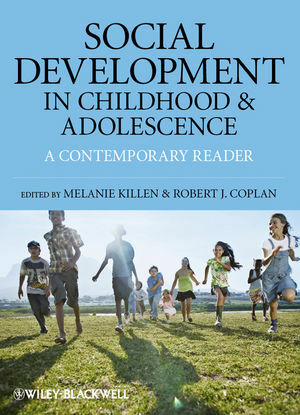 Edited by two leading scholars, Social Development in Childhood and Adolescence brings together the most significant classic and contemporary writings in this area to provide a comprehensive overview of this dynamic field. Covers key topics such as genetics, temperament, attachment, prosocial development, theory of mind, peer relationships, morality, identity, social withdrawal, aggression, exclusion, stereotyping, parenting, and culture. Melanie Killen, Ph.D., is Professor of Human Development and the Associate Director for the Center for Children, Relationships, and Culture at the University of Maryland. Her research is on the development of social cognition, moral reasoning, and intergroup attitudes. Robert J. Coplan, Ph.D., is Professor of Psychology and Director of the Pickering Centre for the Study of Human Development at Carleton University in Ottawa, Canada. His research is on children's social and emotional development and peer relationships. 1. Social Development: Concepts, Theory, and Overview: Melanie Killen and Robert J. Coplan. Part II: Foundations and Early Beginnings:. 2. Biological and Social-Cognitive of Emotions. Temperament and Social Behavior in Childhood: Mary K. Rothbart, Stephan A. Ahadi, and Karen L. Hershey. The Development of Concern for Others in Children with Behavior Problems: Paul D. Hastings, Carolyn Zahn-Waxler, JoAnn Robinson, Barbara Usher, and Dana Bridges. Sympathy Through Affective Perspective Taking and Its Relation to Prosocial Behavior in Toddlers: Amrisha Vaish, Malinda Carpenter, and Michael Tomasello. A Closer Look 1 Is Biology Destiny? The Contributions of Genetics to Social Development. The Nature of the Child’s Ties: Jude Cassidy. Attachment Security in Infancy and Early Adulthood: A Twenty-Year Longitudinal Study: Everett Waters, Susan Merrick, Dominique Treboux, Judith Crowell, and Leah Albersheim. The Effects of Infant Child Care on Infant–Mother Attachment Security: Results of the NICHD Study of Early Child Care: NICHD Early Child Care Research Network. A Closer Look 2 How Do I Love Thee? Attachment and Romantic Relationships. 4. Mental States and Theory of Mind. Mind-Reading, Emotion Understanding, and Relationships: Judy Dunn. Twelve-Month-Old Infants Interpret Action in Context: Amanda L. Woodward and Jessica A. Sommerville. Scaling of Theory-of-Mind Tasks: Henry M. Wellman and David Liu. A Closer Look 3 Autism and Theory of Mind: Understanding Others’ Beliefs, Desires, and Emotions. The Power of Friendship: Protection Against an Escalating Cycle of Peer Victimization: Ernest V. E. Hodges, Michel Boivin, Frank Vitaro, and William M. Bukowski. Children’s Social Constructions of Popularity: A. Michele Lease, Charlotte A. Kennedy, and Jennifer L. Axelrod. Group Status, Group Bias, and Adolescents’ Reasoning About the Treatment of Others in School Contexts: Stacey S. Horn. A Closer Look 4 Leaders and Followers: Peer Pressure in Adolescence. 6. The Development of Morality. The Development of Children’s Orientations toward Moral, Social, and Personal Orders: More than a Sequence in Development: Elliot Turiel. Consistency and Development of Prosocial Dispositions: A Longitudinal Study: Nancy Eisenberg, Ivanna K. Guthrie, Bridget C. Murphy, Stephanie A. Shepard, Amanda Cumberland, and Gustavo Carlo. Children’s Thinking About Diversity of Belief in the Early School Years: Judgments of Relativism, Tolerance, and Disagreeing Persons: Cecilia Wainryb, Leigh A. Shaw, Marcie Langley, Kim Cottam, and Renee Lewis. A Closer Look 5 Learning the Moral of the Story: Education in the Moral Domain. 7. Self Identity and Group Identity. Changes in Children’s Self-Competence and Values: Gender and Domain Differences Across Grades One through Twelve: Janis E. Jacobs, Stephanie Lanza, D. Wayne Osgood, Jacquelynne S. Eccles, and Allan Wigfield. Ethnic Identity and the Daily Psychological Well-Being of Adolescents From Mexican and Chinese Backgrounds: Lisa Kiang, Tiffany Yip, Melinda Gonzales-Backen, Melissa Witkow, and Andrew J. Fuligni. The Development of Subjective Group Dynamics: Children’s Judgments of Normative and Deviant In-Group and Out-Group Individuals: Dominic Abrams, Adam Rutland, and Lindsey Cameron. A Closer Look 6 Who Am I and What Group Do I Belong to? Self Identity in the Context of Social Interactions. 8. Shyness and Social Withdrawal. Don’t Fret, Be Supportive! Maternal Characteristics Linking Child Shyness to Psychosocial and School Adjustment in Kindergarten: Robert J. Coplan, Kimberley A. Arbeau, and Mandana Armer. Trajectories of Social Withdrawal from Middle Childhood to Early Adolescence: Wonjung Oh, Kenneth H. Rubin, Julie C. Bowker, Cathryn Booth-LaForce, Linda Rose-Krasnor, and Brett Laursen. Social Functioning and Adjustment in Chinese Children: The Imprint of Historical Time: Xinyin Chen, Guozhen Cen, Dan Li, and Yunfeng He. A Closer Look 7 But I Like to Be Alone! Unsociability and the Benefits of Solitude. An Integrated Model of Emotion Processes and Cognition in Social Information Processing: Elizabeth A. Lemerise and William F. Arsenio. A Short-Term Longitudinal Study of Growth of Relational Aggression during Middle Childhood: Associations with Gender, Friendship Intimacy, and Internalizing Problems: Dianna Murray-Close, Jamie M. Ostrov, and Nicki R. Crick. A Peek Behind the Fence: Naturalistic Observations of Aggressive Children with Remote Audiovisual Recording: Debra J. Pepler and Wendy M. Craig. A Closer Look 8 A Slap in the “Facebook”: The Study of Cyber-Bullying. 10. Stereotyping, Prejudice, and Exclusion. Children’s Social Reasoning About Inclusion and Exclusion in Gender and Race Peer Group Contexts: Melanie Killen and Charles Stangor. The Development and Consequences of Stereotype Consciousness in Middle Childhood: Clark McKown and Rhona S. Weinstein. In-group and Out-group Attitudes of Ethnic Majority and Minority Children: Judith A. Griffiths and Drew Nesdale. A Closer Look 9 Stereotyping and Discrimination: What Factors Help to Reduce Prejudice?. 11. Parenting Attitudes and Beliefs. The Company They Keep: Relation of Adolescents’ Adjustment and Behavior to Their Friends’ Perceptions of Authoritative Parenting in the Social Network: Anne C. Fletcher, Nancy E. Darling, Laurence Steinberg, and Sanford M. Dornbusch. Individual Differences in Adolescents’ Beliefs About the Legitimacy of Parental Authority and Their Own Obligation to Obey: A Longitudinal Investigation: Nancy Darling, Patricio Cumsille, and M. Loreto Martínez. Domain-Specific Antecedents of Parental Psychological Control and Monitoring: The Role of Parenting Beliefs and Practices: Judith G. Smetana and Christopher Daddis. A Closer Look 10 Bridging the Generation Gap: Promoting Healthy Parent–Adolescent Relationships. 12. Culture, Ethnicity, and Rights. Parents’ Goals for Children: The Dynamic Coexistence of Individualism and Collectivism in Cultures and Individuals: Catherine S. Tamis-LeMonda, Niobe Way, Diane Hughes, Hirokazu Yoshikawa, Ronit Kahana Kalman, and Erika Y. Niwa. Muslim and Non-Muslim Adolescents’ Reasoning About Freedom of Speech and Minority Rights: Maykel Verkuyten and Luuk Slooter. Chinese Adolescents’ Reasoning About Democratic and Authority-Based Decision Making in Peer, Family, and School Contexts: Charles C. Helwig, Mary Louise Arnold, Dingliang Tan, and Dwight Boyd. A Closer Look 11 African-American Culture: Understanding the Past to Make Predictions About Development.